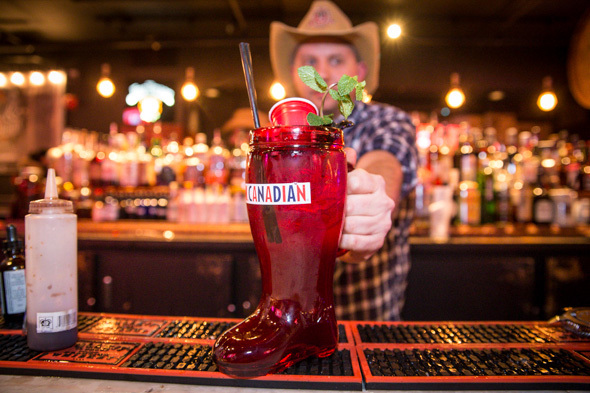 Boots 'N' Bourbon Saloon is leading the charge of Toronto's new-found enthusiasm for country music and cowboy cuisine. 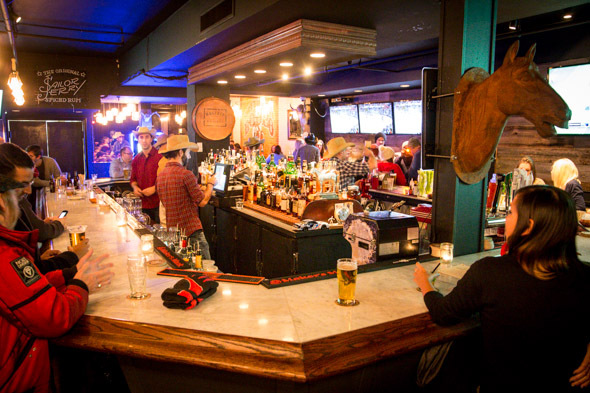 It's one of two western bars to open serendipitously on the same day, and already it shows promise of becoming a major party destination and live country music venue. Matt Dean Pettit of Rock Lobster , along with partners Matt Coulter, Mike Homewood ( Kee to Bala ) and Nav Sangha ( Wrongbar , The Great Hall ) cite four simple components at the heart of the concept: music, food, cocktails and a great room. The loud, 80-seat interior channels Nashville; there's hay trekked in across the floors, kitschy vintage signs, Sante Fe-like cattle skulls and an old-timey mural courtesy of Pettit's artistic dad. 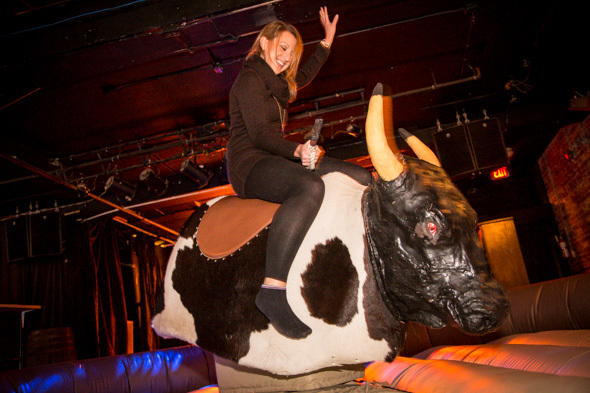 Upfront a horseshoe bar offers action on all sides, a digital jukebox/photobooth and cowboy pinball add to the fun vibe. Moseying on to back, there's a mix of high tables, tufted leather booths, cowhide-covered Eames chairs (in case you forget you're still in the city) and a Deer Hunter arcade game. At the back of the deep space there's a stage for live music and a dance floor for Thursday-night line dancing, otherwise home to the inflatable mechanical bull. The one page menu offers country-style pub grub like snackable bites of Fried Beer Cheese ($8), Bacon Bombs ($8) and Fried Pickles ($7). 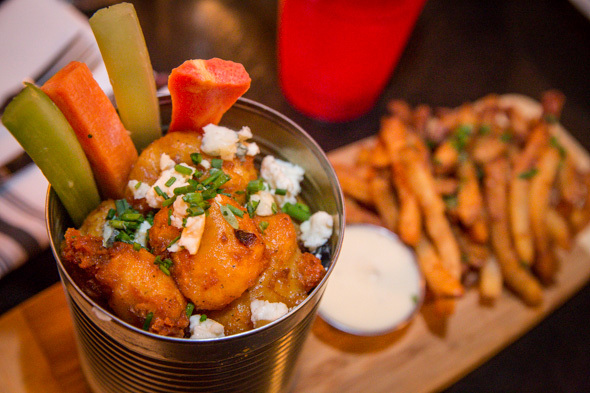 I try the deliciously fried Buffalo Shrimp in a Can ($13) studded with chunks of blue cheese and served with Cajun fries, veggie sticks and tangy blue cheese dip on the side. Many of the small plates are sharable but could also double as decent sized single servings. 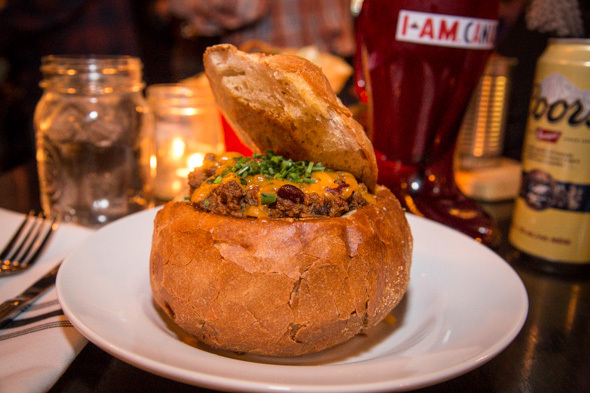 For a hearty home-style option, there's Chilli of The 2nd Day ($9) served in a garlicky hollowed-out bread bowl crowned with melted cheddar and chives. Groups can take advantage of shareable buckets of Fried Chicken ($16/4 piece, $30/8 pieces) or the Redneck Beer Can Chicken ($40) served with a spread of sides. Big appetites can opt for customizable Po Boys ($13) topped with a choice of fried catfish, spicy lobster, fried chicken or shrimp spiced with Cajun, Jerk, or Buffalo. 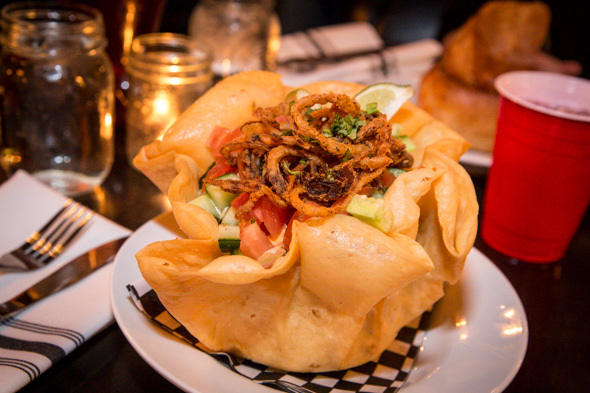 Under the pretence of lighter fare, there's The Old School Taco Salad ($13), layered in a deep fried tortilla bowl with shredded lettuce, ground beef, beans, cheese, spicy mayo, diced tomatoes, cucumbers and crispy fried onions. It's only a couple ingredients away from being a seven layer dip, so well... it's not health food, but it's delicious. The bar program doesn't take itself too seriously. Cocktails like the tangy gin-fortified Red Flip Cup Punch ($10) are served (as the name suggests) in plastic party cups; The Stampeder ($12) is served in a boot-shaped glass filled with Molson Stock Ale, ginger ale, maple bitters, molasses and a final shot of Crown Royal dropped in right before drinking. Draught beers are evenly priced at $7 a pint but a quick survey of the room suggests that shots of bourbon and Coors Banquet tall cans ($6.25) and are the libations of choice. 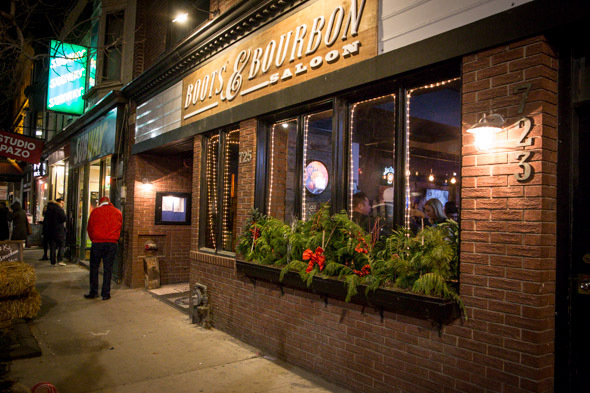 Boots 'N' Bourbon Saloon opens for dinner Monday through Wednesday at 5pm. Lunch is served from noon on Thursday, Friday and Saturdays. On Sundays there is a country brunch buffet with live music starting at 11am.